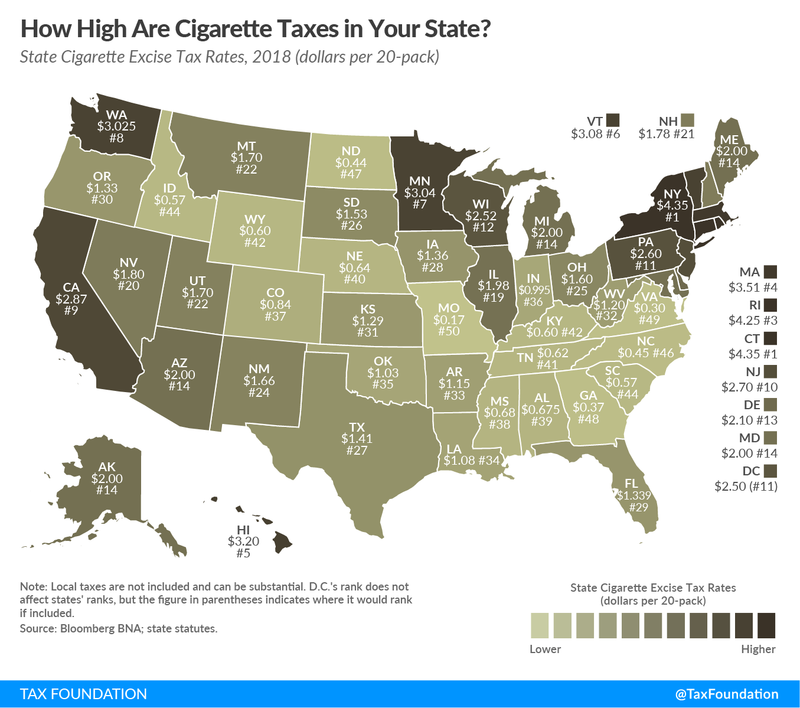 How High Are Cigarette Tax Rates in Your State? For this week’s map, we take a look at cigarette tax rates across the nation and how they vary from state to state. Each state’s cigarette tax is levied in addition to the federal tax rate of $1.0066 per 20-pack of cigarettes. Connecticut and New York share the highest tax rate with $4.35 per pack, trailed by Rhode Island ($4.25), Massachusetts ($3.51), and Hawaii ($3.20). Conversely, Missouri has the lowest rate at 17 cents per pack, followed by Virginia ($0.30), Georgia ($0.37), and North Dakota ($0.44). The average tax rate among states is $1.70 per pack. On average, federal and state excise taxes on cigarettes contribute to 44.3% of the retail price, as of 2016. This does not include the local tax rates that cities and counties can levy in addition to both the state and federal taxes. In the city of Philadelphia, an additional tax of $2.00 is collected per pack; New York City ($1.50) and Chicago ($1.18) also add substantial local taxes. The wide disparity in rates among states and cities is a significant factor in increased cigarette smuggling across the country. Black markets have emerged, particularly in high-tax states that are bordered by states that impose low cigarette taxes. We’ve covered cigarette smuggling extensively on our blog. Cigarette taxes can be touted as solutions to improve public health, but policymakers should be skeptical of using these taxes as long-term solutions to budget shortfalls. The revenue from these taxes is unstable, due to the steadily decreasing number of smokers and widespread smuggling. We have built an interactive web tool illustrating the instability of these tax revenues.